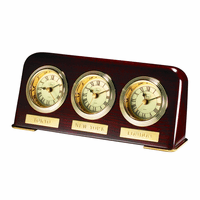 FEATURES/SPECS This Largo Personalized Table Top Clock by Bulova is an ideal centerpiece for an elegant table set-up. 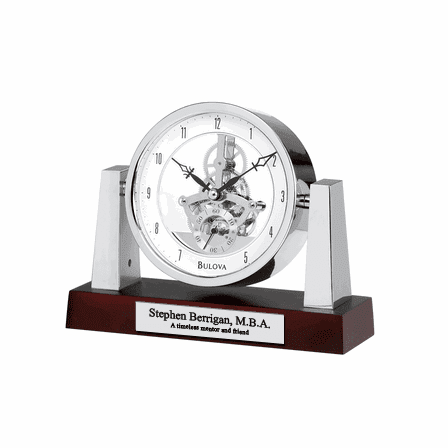 With a solid wood base and a dark mahogany finish, it features a chrome finish pivoting clock housing and supports and a skeleton movement with seconds sub-hand can be observed through the protective glass lens. 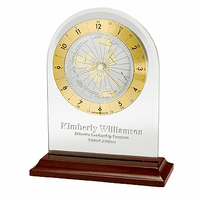 You can have the engraving plate on the clock personalized with up to two full lines of text at no extra charge to you. 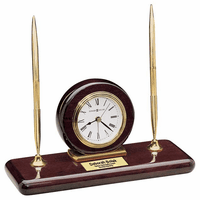 You'll find the most eclectic selection of fine gifts here at the Executive Gift Shoppe. Dimensions: 6" x 7 1/2" x 2 1/2"
The base is 7 1/2" long by 2 1/2" wide. Hello -- can you tell me the color/material of the engraving plate? Sure, the engraving plate is silver with black text. We bought 2 of these clocks as retirement gifts and they were a hit. Both our retirees loved them and the personalization on them. Great quality! I bought this clock for a friend who is opening a small business and added a motivational quote to the plate. He loved it! Very beautiful and elegant.